My delegation subscribes to the statement delivered by the European Union. 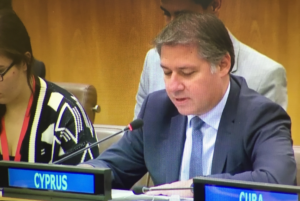 I would like to add the following remarks on the Cyprus’ Question in my national capacity. Internally Displaced Persons: One third of the Greek Cypriot population – 163.000 persons and their descendants – continue to be internally displaced. It is inconceivable that Cypriots continue to be denied the right to settle freely anywhere in their own country. Property rights: The overwhelming majority of properties in the occupied areas of Cyprus are owned by Greek Cypriots. The owners of those properties have since 1974 been deprived of the right to enjoy their homes and properties. At the same time, they witness the unlawful exploitation and use of their properties. Settlers: With a view to altering the island’s demographic character, a very significant number of settlers have been deliberately transferred by Turkey to the occupied part of Cyprus, in gross violation of the Geneva Conventions and the international law. Enclaved persons: The 20.000 Greek-Cypriots who refused to leave their homes in 1974, have now been reduced to a few hundred in the occupied part, as a result of discriminatory treatment on the basis of their ethnic origin, race and religion. Missing persons: Hundreds of persons, both combatants and civilians, are still missing without any information on their whereabouts. We call on Turkey once again to allow unrestricted access to all areas, including access to their archives. 44 years after the invasion, it is our duty to inform responsibly the families of the Missing Persons about their fate. Freedom of religion: Christian communities are systematically prevented from religious worship in churches in the occupied areas, including the right to conduct religious services. Destruction of cultural property: the deliberate destruction of religious and cultural heritage continues in the occupied part since 1974, as well as the looting of Cyprus’ cultural, archaeological and religious treasures. Cyprus continues, at the same time, to follow the human rights situation in Turkey. We remain concerned about its impact on the everyday life of the Cypriots who live under Turkey’s military occupation. We reiterate the need to respect the democratic values, in full compliance with the international law and the respect of human rights. In concluding, Mr. Chairman, I would like to underline my Government’s commitment to the protection and the promotion of human rights and fundamental freedoms of all Cypriots, irrespective of their ethnic origin, race, religion. We aspire to, soon, be able to do that in a reunited country where the rule of law will ensure the full equality of all citizens, in line with European and international standards.